Strictly speaking there was no ULTRA in 1940, that special classification had not been introduced and all the reports were stamped MOST SECRET. For continuity's sake, I'm sticking with ULTRA, however. You don’t have to read the 1940 messages for long to realise that some themes crop up repeatedly and my idea is eventually to post a series of articles here on those topics. I don’t imagine that this source is going to necessitate a rewrite the history of the Battle of Britain all on its own but it does seem to offer some additional details and insights, some of whose significance would probably only be apparent to researchers who (unlike me) have devoted years of research to the campaigns in the West. 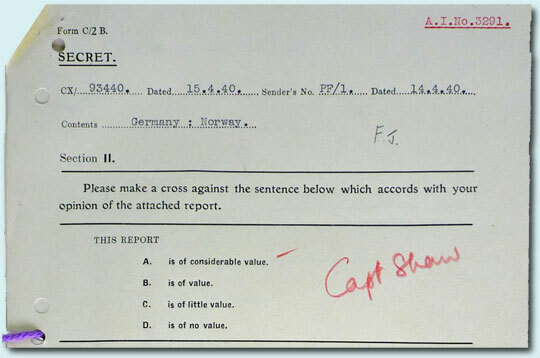 You get the sense that in 1940 the analysts were still learning about the Luftwaffe’s functioning with each day that passed whereas towards the end of the war they seem very much to have a confident understanding of the organisation they were dealing with and many of its personnel, even if it still could produce unwelcome surprises. The individual files for 1940 are big: HW5/4 spans the period 4 August – 11 September and has almost 500 pages. The messages are not reported in the same way as they would be in later HW5 series files. Each set of messages carries a CX/FJ or (from 29 May) CX/JQ/ serial number at the top and then a sequence of numbered paragraphs. Each of these paragraphs appears to represent a single deciphered message but usually heavily paraphrased and often embodying commentary by the British analysts, who sometimes essay humorous remarks about their enemies’ foibles. Paragraphs are grouped under topic headings such as operations, Flak, aerodromes, aircraft markings, signals, administration and personnel. The great majority of the items are from the Luftwaffe. Typically, signals were being broken within 24 hours of transmission although there are occasional batches where it took a lot longer; there are no timings for the issue of individual items, just a time for the report as a whole. Now and then there is a paper several pages long, setting out all that has been learned or deduced to date from the signals on a given topic. I haven’t yet worked out the pattern (if any) on which CX/JQ/1 gave way to CX/JQ/2 and so on. Sometimes there is one CX/JQ a day, at other times two and there’s no set number of sections in each one. A few days before this part of the site went live, the man who made it possible died. John Herivel's inspired idea that German operators would not be altogether conscientious in changing their Enigma machines' settings each day gave the British consistent access to Luftwaffe signals in the summer of 1940.